In this unit, students will learn how to use powers and roots in Mathematics. They will begin by looking at square and cube numbers and their corresponding roots (including negative square roots). They will then move on to looking at index notation, calculating with indices, the index laws, and working with the order of operations and brackets. Finally, students will study how to use calculators to solve problems with indices. This pack is designed to provide teachers with complete lesson plans and classroom resources to teach excellent lessons. 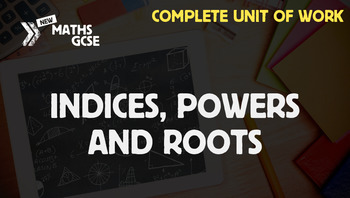 It is designed to both teach the mathematical content and draw students into deeper consideration of its implications, including the mathematical reasoning and problem solving skills required for the new Maths GCSE. Lesson Resources: A variety of additional resources to accompany the lesson plans, including student worksheets and aids for students needing extra support. 2 Homework Activities: Further activities to give students to complete at home. Assessment: A series of questions to enable you to assess the progress of students in this unit of work.